Join Gardenia’s Happy Bread Day! Join our favorite bread, Gardenia, as they celebrate the Happy Bread Day! Happening on 28 October, Monday at the Activity Center in Glorietta between 10-9PM. Fun activities, exciting prizes and overflowing of breads await those who will join this delicious occasion. You can also witness the opening of the Gardenia Bread Town. Entrance is free so come one, come all! This entry was posted in free grub and tagged food, food events on 22.October.2013 by admin. 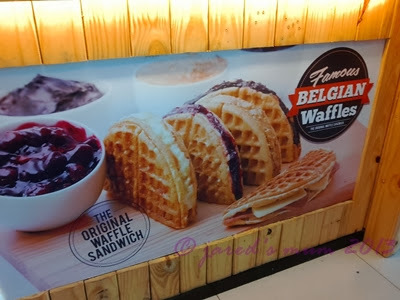 I first heard about the Famous Belgian Waffle opening in Waltermart – Plaridel from a mum friend from the little man’s playschool. I never really jumped in to try it, but I am quite a fan of waffles. According to Wikipedia, the Belgian waffle is a waffle type popular in North America and is identified by its larger size, lighter batter, and higher grid pattern that forms deep pockets and has larger squares than the standard American waffle. 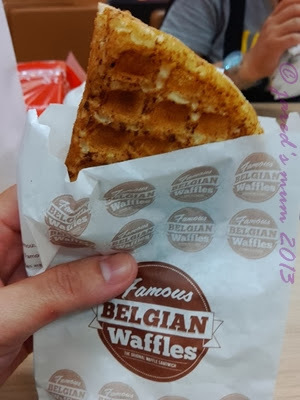 We finally managed to try the newly-opened waffle shop when we visited the mall one weekend. I became an instant fan! I tried their Banana-and-Peanut-Butter blend and I loved it! I also think that the Blueberry-and-Cream-cheese concoction is such a mouthwatering treat! So when we visited the mall last Sunday to do some errands and buy gifts for the little man’s playschool classmates celebrating their birthdays on the 15th, I made sure to drop by the Famous Belgian Waffle kiosk to get some delectable waffles! You can smell the lovely scent of freshly-made waffles a few feet away from the stall. After we’re done window shopping and looking at items for sale, including this lovely piece of jewelry, which are also sold in this shop, www.reeds.com/designer-jewelry/Honora-cat41.html, I went straight to the waffle stand to order their Ham-and-Cream-cheese waffle. What can I say, I enjoyed it, too, since I really am fond of cream cheese! This entry was posted in food musings, short order and tagged breads on 18.October.2013 by admin.